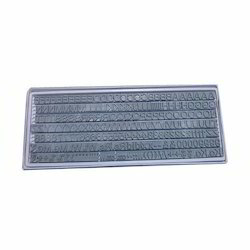 Manufactured in compliance with the set industrial norms, the offered Batch Printing Machine Spares quality is always maintained. Owing to the high grade raw materials and modern machinery used in its making, the product has a commendable functioning and sturdy construct. This range comprises of Spares For Automatic High Speed Batch Printing Machines, Roller Guides and Brass Lever Types L & R.
We are a coveted organization that is engaged in manufacturing and supplying excellent quality Rubber Stereo. To manufacture these stereos, we make use of quality-approved components and spare parts. Post-production, our range is thoroughly inspected in order to rule out every possibility of defect.